AC Milan have joined the chase for Atletico Madrid striker Mario Mandzukic, who has also been targeted by Arsenal and Liverpool. Atleti coach Diego Simeone has confirmed that the Croatian international can leave the club if an adequate offer is forthcoming. According to the Daily Star, Arsenal are looking to profit from Atletico’s willingness to offload Mandzukic, with Arsene Wenger believed to be an admirer of the forward, having previously been linked to him during the January transfer window. The British source report that the powerful forward is valued at £15.8million, and with the Croatian’s relationship having broken down with Simeone, he is available this summer. The 29-year-old — who arrived at Atleti last summer — has scored 12 goals in 28 Liga BBVA outings this season, and also contributed five goals in 10 Champions League appearances. Milan have also been keeping tags on the forward, with the club’s CEO Adriano Galliani admitting that he was an admirer of the player: “I am meeting some Atletico directors,” he began, speaking to AS [via Football Italia]. Milan are also weighing up a move for FC Porto forward Jackson Martinez according to the Corriere dello Sport. 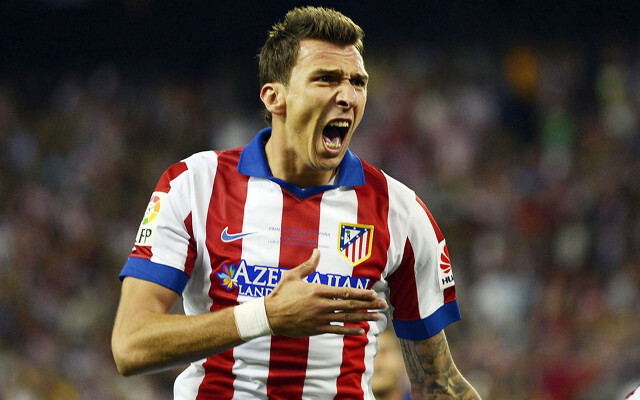 Should they opt to bid for the Colombian forward, it may well leave the door open for Wenger to acquire Mandzukic. Liverpool are also believed to be keen on the forward, who won the Champions League with Bayern Munich in 2013, according to the Metro.